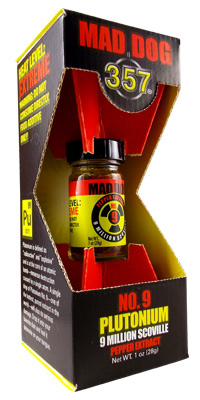 Mad Dog 357 Plutonium 9 Million Scoville Pepper Extract- A single atom of plutonium is capable of immense heat and destruction. This pepper extract is one of the hottest and purest in the entire world—is capable of the same. 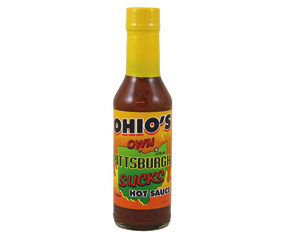 If you just want a little heat in your food, this is NOT the extract for you. This little bottle is for the true aficionado of heat, the one who wants to test the limits, to see how explosive pepper heat can be. Blow something up at supper tonight. As I use this as a burger mix ingredient, I put one serving too many in the ground meat, I learned the true integrity of the worlds hottest pepper. As I sit on the porcelain throne, I was making the sounds of a humpback whale being butchered by a blind man with a chainsaw. My roommate decided to call 911 and I was admitted into the ER until I was discharged 3 hours later in due recovery. The next day, I was sent to a GI physician were I was violated with a snake like camera up the derrier to find out that I had the cleanest bowels on the market with no sign of abrasion or tearing. I recommend this product to anyone who needs a bowel cleaning. Comes with a massive gastric explosion. Was well worth the removal of 75%of my digestive tract. Would do it again if I had more lining to give.. Five stars!!! Gets me bubbly and hyper! USE EXTREME CAUTION especially if you do not know your limits! But with that said you can spice a dish from mild to melting your face off.....Fast! If you are like me and believe food isn't hot enough unless your belly is on fire then this will do you well but if not this will still work for you when used sparingly. Add a little (toothpick about 1/8 inch into warmed extract) for enough bite to notice it in a dish for one person. Or for hot as hell dip a butter knife about 1/2 inch into the warmed extract and breath fire after the first bite (this is how I like it). For that matter I did that in one pack of ramen noodles with vegetables and it was FLAMING HOT and it felt like I got hit in the belly by a semi truck and it HURT and I LOVED IT! I have also noticed that a few minutes into the burn I get all bubbly and hyper. The truly best use of this is to keep your food safe, and if you grew up in a big family like mine (6 kids) you know what I mean. Just use this fire paste and the flies won't touch it (this comment not yet tested) let alone your family members, assuring that you can use the bathroom and come back to find your food still there....I do recommend keeping the bottle with you though, so they don't spike it more while you are away. At this point I can offer someone homemade chocolate chip cookies and they hesitate to take them asking "did you add your hot sauce?". Effective, you ask? Certainly, I say! This is a must have in any cupboard. This will not last as long as I thought, given my desired level of heat, but so extremely worth it and I will buy it again. This stuff is better than Coffee in the mourning to wake up... But by noon I am having to Wipe with a Popsickle..
Unbelievably hot!!! Just the tip of a toothpick hurt for hours. The only odd thing is it solidified to more of a gel after being opened. This is the hottest stuff I have ever had! It puts raw ghost peppers to shame. It doesn't really have a flavor. It's just all heat and it is the hottest thing I've ever tried. It only takes a small amount (about the size of a couple grains of sand), to add a very noticeable heat to a family sized meal. Treat it with care and watch what you touch, if you get this stuff on your fingers. It doesn't just wash off your finger tip and it will cause a bit of pain to sensitive areas. An ounce may seem like a small amount for the price, but this really will last you and it is worth every cent. This is the absolute hottest thing I have ever put in my mouth. A drop in a pot of chili creates a fiery furnace in your mouth. The best around and worth every dime!! !